In consideration of our patient’s privacy and comfort, we recommend visiting from 8 am until 8 pm. Visits outside of the recommended hours may be arranged by contacting us directly. No. We work with Medical exclusively. Patients work with our staff as often as is needed to meet their physical therapy objectives as laid out by their physicians or physical therapists. Our goal is to help keep our patients as active as possible. A facility telephone can be made available for use upon request. Televisions are available for all patient’s rooms. There are also flat screen televisions with cable in common areas for TV viewing. Which languages are spoken at Golden State Care Center? At Golden State, along with English, we have staff members who speak Spanish and Tagalog. Physicians generally see patients/residents upon admission and once every 30 days for long-term care residents. 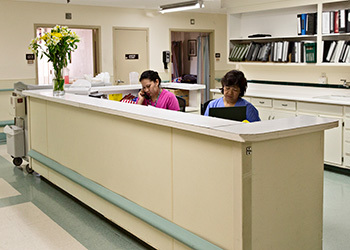 However, our nursing professionals are in constant contact with all of the physicians that visit the facility. Check with our nursing staff for further information. Yes, we have beauty and barber shop services available. Please inquire at the front desk for appointments and prices. What is your relationship with the San Gabriel/Pomona Regional Center? The San Gabriel/Pomona Regional Center (SG/PRC) is our placement agency. Their primary function is to coordinate quality services and care for adults with intellectual disabilities. We have worked with them for over 25 years. The San Gabriel/Pomona Regional Center (SG/PRC) is one of 21 regional centers in California operated by private nonprofit corporations which contract with the State Department of Developmental Services to coordinate services for people with developmental disabilities. Each regional center is governed by a Board of Directors that sets policy and direction for the regional center. The SG/PRC Board of Directors is made up of volunteers from the community. The composition of the Board as defined by the Lanterman Developmental Disabilities Services Act shall be composed of at least 50 percent parents and/or persons with developmental disabilities.